Handcrafted Pilsner from the Kingdom of Bohemia, Czech Republic. 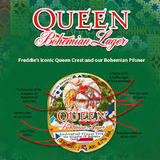 The Original Bohemian Rhapsody Pilsner! Brewed in the Kingdom of Bohemia with locally sourced Saaz Hops and Moravian malt with soft Bohemian water and only Czech yeast. A PGI certified pilsner lager like no other.